If you read our blog regularly but haven't tried our tea yet, you are missing out on the full Mellow Monk experience. After entering the code, be sure to click the "RECALCULATE" button ... and watch your shipping charges magically disappear. (Please note that this offer expires in one week. And sorry--this offer is for U.S. orders only. We look forward to welcoming you to the Mellow Monk community. You'll find we're a very mellow bunch. One of the songs Elvis Presley sang at his 1973 Aloha from Hawaii concert was "I'll Remember You," which was written by Hawaiian singer/songwriter Kui Lee. Another nice, mellow Kui Lee song is "The Days of My Youth" [MP3 preview from Mele.com]. Yummy—grilled salmon with kabosu; simmered deep-fried tofu and mizuna; avocado and tomato salad; rice; and potato miso soup. In Japan, stressed-out city folk head to the hills for "farm therapy"
Pounding mochi: The farmer gets a helping hand, and the lass gets some much-needed sunshine, exercise, and stress relief. Here is a higher-resolution version of the slideshow I posted recently of pictures from my tea-buying trip to Kyushu that was documented for European TV. You can watch the slideshow in dazzling full-screen mode by clicking the icon next the "Vimeo" name in the lower right corner of the movie player. Here's a time-lapse video of the galactic center of the Milky Way rising over this year's Texas Star Party. The book Three Cups of Tea isn’t about tea, but it does relate to the philosophy of tea. After an unsuccessful attempt to climb K2—the world’s second highest mountain—Greg Mortenson became lost and eventually staggered, exhausted, into a remote village in northern Pakistan. The village’s children had no school or teacher. In exchange for nursing him back to health, Greg promised the village elder that he would return and build a school there. Which he did—and then some: He and the organization that he helped found has built a total of 55 schools in the region. The first time you share tea with a Balti, you are a stranger. The second time you take tea, you are an honored guest. The third time you share a cup of tea, you become family. . . In other words, tea is not just a means of achieving inner tranquility but also a way to bond with others. In Japan, a cup of green tea offered to a guest is the foundation of hospitality. Perhaps it's the symbolism of sharing one's bounty with another. But I also suspect that mellowness induced by green tea is infectious. Just as it helps us find harmony within, green tea, I believe, also creates harmony with others. Greg Mortenson bonded over tea with people in a culture he previously new little about. Perhaps green tea can open a similar door for you. Japan has revamped its Miss Universe competition—and why do I have a feeling this is coming soon to the rest of the world?—to include elements like martial arts contests. The swimsuit competition will be followed by the Enter the Dragon-style martial arts death match portion of our program. This is the latest in a series of photo, text, and video posts about my most recent tea-buying trip to Japan, which was documented by a film crew from Europe's Arte Network for its "360° Geo" TV series. The L.A. Times has been running a lot of stories about green tea of late. Here is one about pots de creme (a.k.a. custard) made with matcha. Of course, you already knew that green tea and chocolate are an exquisite match, yes? Matcha custard with (clockwise from top) white vanilla, milk chocolate, and dark chocolate. Morning lychee green tea, green tea liqueur, Sergeant Pepper's orange LHCB rooibos, and Romeo and Juliet's green tea hearts (pictured below)—just a few of the wares on display at the World Tea Expo. What I most admired about the artistic approach taken by the film crew—and the producers back in Germany—was their desire to explore green tea not merely as a beverage but as a key element of Japanese culture. In fact, the documentary's theme was that through green tea, you could understand every aspect of Japanese culture. The director, Ilka—here is a clip of the English version of one of her documentaries—was herself keenly interested in the role of green tea in Japanese Buddhism. She had done plenty of research before coming to Japan and had learned that the Buddhism–green tea link began over a thousand years ago in China, after monks discovered that drinking green tea kept them alert and focused during marathon meditation sessions. I myself knew a bit about monks and green tea. After all, our company's namesake is a Japanese monk who was one of the first to bring green tea to Japan from China. But I hadn't heard of tea's use in meditation. Unfortunately for our intrepid director, none of the monks we interviewed would definitively state that the tradition was being strictly continued today. Some monks did drink green tea while meditating, but others drank black tea. Some drank coffee. Some even drank—gentle reader, are you sitting down?—instant coffee. It was, you know, a personal choice. In fact, our smooth-headed friends would not even state on camera that the monks of yore actually did drink green tea for its stimulative properties. The closest we got to this confession—after much prodding—was getting one monk to confirm that yes, he had heard the theory—the theory, mind you—that Chinese monks had begun imbibing green tea to keep them focused during long hours of meditation. "But does he personally—and his fellow monks—still drink green tea for that very same reason? Ask him," implored Ilka. All the other monks whom we had previously asked this question—and we had asked them all—were too polite to come right out with a negative answer. So instead we received replies like Well, I wouldn't really say that or Not me personally, but others do, I'm sure. But this monk was different: Tall, solidly built, and with a steely-eyed, quietly tough attitude to match, he clearly would not be one to mince words. When I finished translating the director's question, he paused briefly, with furrowed brow, then boomed out his reply: a deep, resounding "NEVER!" The crew and I almost fell over laughing. Ilka naturally did not share our laughter but instead turned away, one hand pensively stroking her chin, with a look that resembled resignation and . . . something else. That "something else" could have been the seeds of an idea—perhaps common in the filmmaking world—that would let her get the last laugh. Months after I had returned home, a small, stiff envelope arrived in the mail: my DVD copy of the show. While viewing the program that night—cup of celebratory tea in hand—I noticed a highly amusing and creative edit: Our nay-saying monk's words had been deftly edited so that he seemed to be saying simply that "monks drink green tea to stay alert and focused during meditation." Sneaky? Yes. But hey, that’s show business. But I, too, have a confession to make: After our temple visit, I also engaged in some creative editing. Whenever we interviewed someone for the documentary, we had to ask that person to sign a standard release form that Arte Network was required to have on file in order to broadcast the footage of that person. Consequently, if the film crew forgot to get a signed release from an interviewee, or if the signed form was lost after filming, Arte would be legally unable to broadcast footage of that person. But that’s exactly what I did after we filmed at the Shogoji Temple—I lost the bloody permission forms for the two monks we interviewed (including Dr. No). More specifically, my brother-in-law—at whose place I was staying when in Aso—burned them along with the rest of the trash after dumping the forms into the dust bin along with the rest of the clutter on the kitchen table. After he told me, over the phone, about his trash collection and burning procedure, and that he had just implemented it the previous day, I knew that’s what had happened. A chill ran down my spine when I got off the phone. The temple was at least 2 hours away, 4 hours round trip—4 hours I knew I could never squeeze out of our already air-tight schedule. Hold on a second, I told myself. Think, man. Think! Then it occurred to me: The monks had signed the forms; it's just that those forms were no more. As far as the monks were concerned, their permission was still in effect. That wouldn’t change even if I, say, gave the director a “substitute” form written by someone else—and in a language unintelligible to the director. So, I had my brother-in-law fill out two new forms, using whatever details I could remember and making up the rest. The upshot: Ilka got her signed forms, and the monk interviews stayed in the film, with no one the wiser. The green tea adds a soft light green color and lemon flavor making the drink tasty and refreshing. Tea gently smooths alcohol taste making the cocktail simple delish. Shake the ingridients with ice and strain into a cocktail glass. Garnish with a lime twist. Rare Tea has a simple recipe for a green tea mojito that sounds absolutely fabulous. Here is an interesting concept—photoshopping your adult self into old photos of you as a child. Ah, the lessons and warnings I could give my young self . . .
Chino the adult in Paris with Chino the child. I used Animoto to make an animated slideshow—complete with musical soundtrack—out of the photographs I took during last year's tea-buying trip. Animoto, by the way, is very cool. Boseong is known in Korea, and internationally, for its tea. But it is also a place of wonderful natural beauty, as photogenic as the most beautiful mountain peak in Korea. More pictures of Boseong are here. Tea makes for such beautiful landscapes, doesn't it? From an article at the Detroit News on the benefits of green tea comes this recipe for green tea lime pie. If you can't find Key limes, don't worry. This recipe is all about the flavors of green tea and tart lime. Whisk the zest and yolks in a medium bowl until the yolks are tinted light green, about 2 minutes. Beat in the condensed milk, green tea, and then the lime juice. Set the mixture aside at room temperature to let it thicken. Adjust an oven rack to the center position and heat the oven to 325 degrees. Mix the crumbs and sugar in a medium bowl. Add the butter and stir with a fork until well blended. Transfer the mixture to a 9-inch pie pan and press the crumbs over the bottom and up the sides of the pan to form an even crust. Bake until lightly browned and fragrant, about 15 minutes. Transfer the pan to a wire rack and cool to room temperature, about 20 minutes. Pour the lime filling into the crust and bake until the center is set, yet wiggly when jiggled, 15 to 17 minutes. Cool to room temperature on a wire rack and then refrigerate until well chilled, at least 3 hours. Up to 2 hours before serving, whip the cream until medium peaks form. Spread the whipped cream evenly over the pie with a rubber spatula. Return to the refrigerator. To serve, slice the pie and transfer to serving plates. Makes 1 9-inch pie; serves 8. Tea expert Sally Mimura Sarin pours a cuppa. These lil’ discs of goodness may just be my new favorite hard candy. And the reviewer at Candy Addict likes them, too. Anyone who sends me some will instantly receive good karma for life. Ah, little discs of goodness. 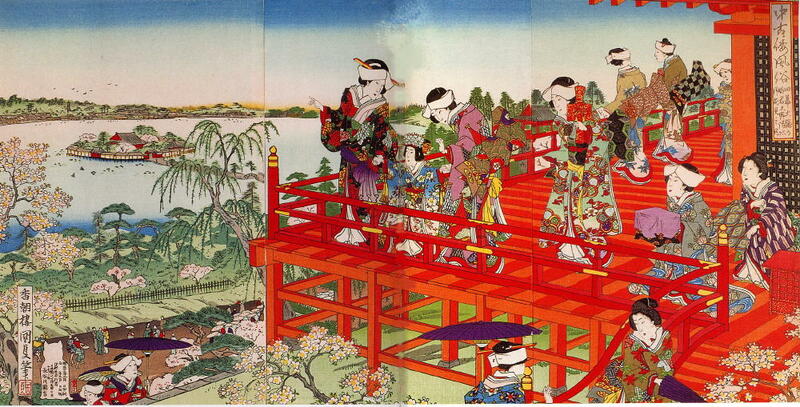 The spectacular painting below, by Kunisada Utagawa, depicts flower-viewing (hanami) at Kiyomizu Kannon Shrine—which you can still visit today. This is only part of the amazing painting. Click the see the whole thing.